One of the biggest movers in the Australian wine field is the Stonefish label, and the managing director, Aussie Peter Papanikitas, is an enthusiastic promoter of the brand. Now, with many of his wines being gold medal winners both in Thailand and overseas, Peter Papanikitas has every reason for the enthusiasm. 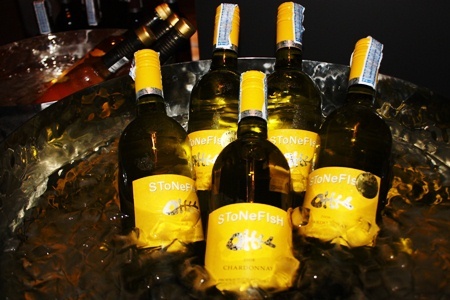 To introduce Stonefish to Pattaya wine outlets, a wine dinner was held at the Centara Grand Mirage Beach Resort in the Acqua Italian restaurant, following a cocktail event on the 19th floor of the resort. 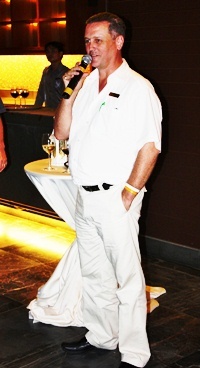 At the cocktails, many of the F&B professionals in Pattaya could be seen in huddles, and trying to look inconspicuous. Amongst these were the Royal Cliff Beach Resort and the Marriott. 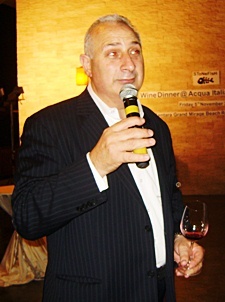 Peter Papanikitas, managing director of the Stonefish Australian wine label enthusiastically promotes the brand. 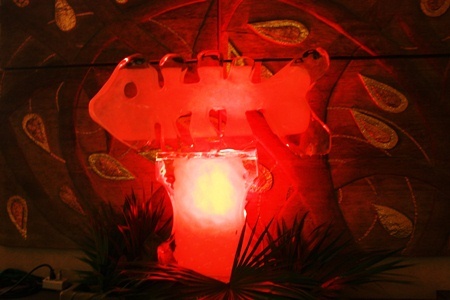 The most favored wine at the cocktail party was the Stonefish Merlot, with many of the guests taking their Merlot glasses with them as they descended to the ground floor and the Acqua restaurant. A few words on the Acqua, if you have not yet tried this restaurant. Glass walls, with a wine cellar sandwiched between, very high ceilings and well trained attentive staff. This is an up-market venue and is most impressive. We will do a full review in the future. The Stonefish Wine Dinner began with a timbale of dill marinated salmon topped with sour cream and caviar and taken with the Stonefish Chardonnay 2008. This is a slightly oaked wine from Western Australia and was a wonderfully refreshing start to what was to turn out to be a very popular dinner. 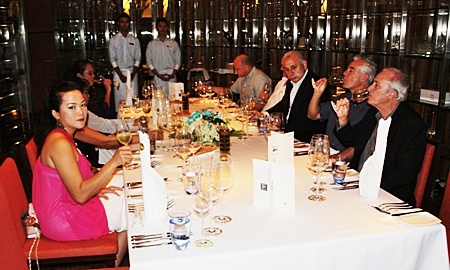 Mark Cawley, EAM F&B Centara Grand Mirage Beach Resort Pattaya welcomes the distinguished guests. This was followed by a creamy risotto with fresh and very succulent tiger prawns enjoyed immensely while the serving staff continued to refill the chardonnay glasses. We could see it was going to be a heavy night with many more wines to come! The next course was one we do not see too often, being a warm salad of pigeon breast with a game hazelnut Hollandaise, accompanied by the first of the reds, a Stonefish Shiraz 2007. This was another Western Australian wine and perhaps a little young at present, would be perfect for laying down in your cellar (if you can resist opening and drinking right now)! It was time for a grappa sorbet, further discussion on the forthcoming wines and a lamb loin wrapped in aged Parma ham accompanied by the Stonefish Cabernet Sauvignon 2006, another of Peter Papanikitas’ medal winners. This wine, for me, had no chance of being consigned to the cellar – it demands drinking now! It was that good. Again there was a hiatus to prepare the guests for dessert and the Stonefish Flying Finix 2006, a wine that had the diners in the Acqua restaurant in raptures. A botrytis Semillon from the Riverina district in New South Wales Australia. A smooth and mellow wine with just enough sweetness to keep you coming back again and again. The wine also has a connection with Pattaya, with the motif on the bottle being designed by local artist Chitra Chandrasiri. This wine just topped the evening and is one that could be cellared for many years, just getting better (if that is possible) with every passing year. I do know that my bottle of Flying Finix has no chance of languishing in my cellar! I don’t even need an ‘excuse’ to open it. By the time you have read this article, it will be an empty bottle. 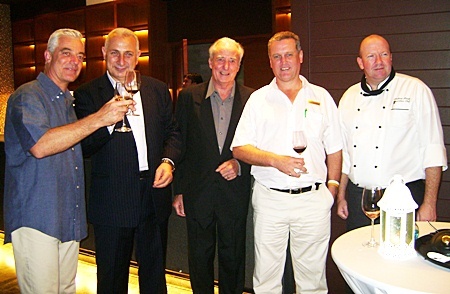 (L to R) Adrian Brown, GM Centara Grand; Peter Papanikitas, MD Stonefish wines; Dr Iain Corness; Mark Cawley, EAM F&B, and Executive Chef Andrew Brown introduce the Stonefish Australian wine label. 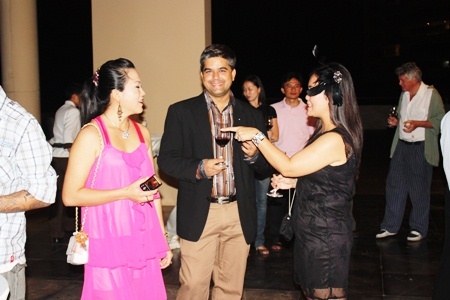 Som Corness (left) and Rungratree Thongsai (right) share a laugh before the dinner while Tony Malhotra (center) only worries about his wine. Guests enjoy a superb evening in the Acqua Italian restaurant at the Centara Grand Mirage Beach Resort.